Like most people, to me the biggest attraction in Gentry is being able to brew my own decks and to try and discover hidden gems. Add in the fact that we have a very healthy metagame right now, and more than enough regular events to try out a new deck and you have everything you need to make a Spike like myself a happy camper. They all play Highland Lake. I don’t know if this is just a really big coincidence or that I unwittingly gravitate to the Blue/Red color combination. But if you have the possibility to make 4 wildly different Gentry decks in just 1 color combination it really shows the diversity of the format and the tools it gives to this particular color combination. So without further ado, let’s start with my personal number one. This was one of the first Gentry decks I’ve built and it’s still a fine option these days. Back when I first built UR Eldrazi, Whirler Rogue and Tomb of the Spirit Dragon where still legal. Imagine combining these 2 cards with a powerful beat stick in Vile Aggregate and a Anthem effect in Ruination Guide. It quickly becomes clear why this deck was one of the top choices during that time. Tomb of the Spirit Dragon stood out specifically. That card was insane in the longer games, allowing your life total to go up to double digits over the course of a few turns. Sadly, the deck had a bit of downtime after the Khaladesh rotation. Losing Whirler Rogue really put the hurt on the overall synergy as suddenly Vile Aggregates and Ruination Guides didn’t feel as powerful anymore. I tried to go another direction by just straight up replacing the Whirler Rogues with Snare Thopters but that card, while very strong at times, just wasn’t in line with the general idea of this deck. Luckily, when Aether Revolt came around a new card was printed that got me very excited the first time I read the spoiler. Suddenly, if you can tune the deck a little bit for it, you once again have a 4 drop 2/2 that comes with 2 Thopters! It looks like Whirler Rogue has found its successor, and I look forward to seeing UR Eldrazi being a viable option once again. 1) Metallic Mimic: This deck plays 18 Eldrazi cards, with some of them even creating an Eldrazi Scion. Leave the Mimic on the battlefield and it will continue to boost almost all of your creatures.The 2 drop slot is not heavily contested and it’s also an artifact that can help you power out an early Silent Bob. 2) Aethersphere Harvester: imagine you’re playing an aggro match-up, what’s the number one rare you need to break the symmetry? I’m not saying your number 1 should be Aethersphere Harvester, but lifelink on a 3/5 flying body with a very low Crew cost will really break the race open in your favor. 3) Elder Deep-Fiend: Speaking about racing, this card allows you to clear away all blockers or just tap all your opponent’s lands for 1 turn. Alpha strike is just 1 combat away. 4) Drowner of Hope: now I understand if some people would prefer Chandra, Flamecaller at this slot but me and Drowner go way back. It’s also really filthy if you have Metallic Mimic out. Creating 10 power out of nowhere surely will tilt combat in your favor. That’s it for deck 1. Now we go from an old favorite to a rather new kid on the block. This build has been a collaboration between me and Frederik Mortier and its quickly becoming one of my favorite decks! So far, it allowed me to reach 2nd place at the Aether Revolt Game Day in Outpost Ghent in a field of a whopping 26 players! This deck is just awesome to play! That’s all I have to say about it. Oh, you still want me to elaborate? Fine, but you asked for it. UR Artificers is a “spin-off” of the Whirler Virtuoso deck that plans to make infinite Thopters, acting more like a good value deck that aims to win through attrition. Yes I know, Anonymous voice. Just hear me out. While I do know that it’s possible to have three Decoction Modules out with a Whirler Virtuoso to make a thousand little buzzing flying 1/1’s it’s actually not the primary goal of this deck. The goal is simple, you don’t aim to make infinite tokens with this deck, just a lot… like, enough to kill your opponent in one swoop. After all, what’s the difference between 20 flying tokens or 20.000? You’ll swarm your opponent to death either way. The 2 cards that are running this engine are either Whirler Virtuoso or Maverick Thopterist (Further known as Jay and Silent Bob) and Decoction Module. These form the core of the deck. Once you reach the late game you have a lot of inevitability by bouncing either Jay or Silent Bob and replaying them. Repeat this a few times and you will bury your opponent under a sea of card advantage. Just don’t forget to keep 4 mana open if you anticipate a removal spell in response. – It protects your Artificers from pesky burn spells like Shock, Harnessed Lightning and Savage Alliance. – It makes sure you have good blocks. Not to be underestimated in this format! – It’s a decent mana sink in the late game. You can switch it to an attacking creature and then equip it back to a blocking creature. All of that in just a 1 mana artifact. I know right…. Deece! Well, well, anonymous voice, you’re quite the perceptive little fellow. While it’s true that this deck plays quite a low land count, I would even take it a step further and say I think there is even room to cut some more lands! Essentially, you are playing 24 mana sources if you count the Renegade Maps. That’s the standard land count for any normal curve deck. If you take a closer look at the 5 and 6-drops you’ll see that they all have Improvise. This means that there are actually a lot more than 24 sources to cast your high drops. I’m not very good at statistics, especially when there are a lot of variables in the equation, but I would say you could also count Inventor’s Goggles and Decoction Module as mana and even ramp, allowing you to land a turn 3 Silent Bob (Maverick Thopterist). Maybe Aether Swooper can even be counted as mana, creating a Servo when it can connect, but that card is more prone to creature removal. All of a sudden you’re looking at 32-ish mana sources to cast your Bob’s and Bastion Inventors. How’s that for 20 lands! Speaking of Bastion Inventor, he used to be a Gearseeking Serpent, but evolution goes fast on Khaladesh. Now he changed to an Improvising Inventor (Bastion Inventor) with just really thick skin. (Really, you could have all the Shocks in the world and Harness all the Lightning in the sky, none of it will hit this guy)The reason I made this change was because I grew to dislike the steep mana cost of the Serpent, double blue mana and also needing to have 5 artifacts on the field to make it really cheap. That requires some time for this deck, while the Bastion Inventor generally comes down a turn or even two earlier. And if you happen to have the Goggles out to equip he even has the same power and toughness as Gearseeker Serpent. You trade in Unblockable for Hexproof which could be a deal breaker but I’m fine with the change so far. There’s even a 4th one in the sideboard that comes in against decks with a lot of removal. 1) Metallic Mimic: Much like in the Eldrazi deck, this little fella is here to pump up either your Artificers or Thopters. It’s also a cheap artifact that will help cast your more expensive spells. 2) Pia Nalaar: I wanted another Artificer in the 3-mana slot and what card better than this one? Creating a Thopter and having 2 relevant keywords on her is just bonus! 3) Aethersphere Harvester: One of the weaknesses off this deck are really aggressive red decks. Aethersphere Harvester stops those dead in its tracks. The card is also better here than in the Eldrazi deck because you have more sources of Energy. 4) Saheeli Rai: This card is pure value, copy a Jay or Silent Bob? Yes please! Even copying Aether Swooper will give you 2 body’s back. Oh and not to be forgotten, you could copy one of your Modules to get double Energy for a turn! Or maybe even infinite? That’s it for the second deck. Now, the 2 decks I’ve described above are tried and true. Both have given me a lot of success in tournaments and they’re both very awesome to play! This is the Gentry version of Raphael Levy’s Pro Tour Khaladesh deck. I’ve tinkered a bit with it while it was in standard and figured a Gentry build could also be viable. The basic idea of this deck is set up a recursive engine with one of the 8 Stitchwings. Cards like Cathartic Reunion and Tormenting Voice on turn 2 allow you to discard one of them, so when turn 3 comes around you can start returning them to the battlefield while hopefully getting some Madness value. – As it stands now, the deck plays 10 + 8 discard outlets. I count the stitches separately because you need another discard outlet first to get them in your graveyard. There is a corner case where if you play against control, and are on the draw without a discard spell , you skip your third land drop and discard them to hand size. – These discard outlets are combined with 8 Madness cards and 9 cards that actually care about being in the graveyard. The Stitchwings and Prized Amalgam. – 5 Emerge cards in the deck allow you to both make your Stitches a little bigger and have them back in your graveyard, ready to be brought back at will. This should form enough consistency to ensure you keep gaining value while bringing back your creatures from the graveyard. Eventually, you’ll grind your opponent out of resources. Especially if there is a Prized Amalgam somewhere in the mix. One of the biggest weaknesses in the Gentry Version is you only get to play 1 Prized Amalgam. This is what really separated this from the Standard deck because every draw you have with the Amalgam just feels so much more powerful. Just don’t forget to get your creatures back at the end of your or your opponents Main Phase. Now, as you might have noticed there are also some Eldrazi in there. 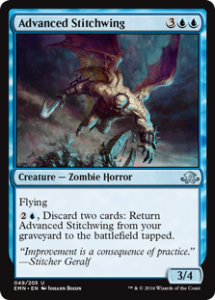 You see, if you can bring back a Stitchwing on turn 3 that means you have the possibility to emerge an Elder Deep-Fiend, Wretched Gryff or even a Vexing Scuttler from it on the following turn. Both the Gryff and the Scuttler will provide you with an extra card in hand, so you can keep the value train going. I would also advice to just stop making land drops after 5 lands. Cards in hand are a real resource in this deck and you don’t want to run out of them. 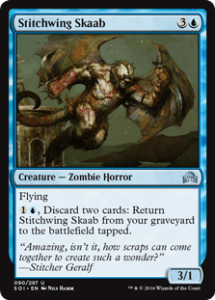 5 mana is kinda the sweet spot because that will allow you to get a Stitchwing back while also Madnessing out either Nagging Thoughts or Bloodmad Vampire. 1) Prized Amalgam: I’m not even going to bother writing down why this card should be in the deck. 2) Elder Deep-Fiend: Creating an opening to get your creatures through or tap their lands when they don’t expect it? Expect Elder Deep-Fiend to be an excellent card in this deck. 3) Fevered Visions: Drawing 2 cards a turn is actually quite important for this deck to keep the flow going. This little enchantment will provide you with that. I could imagine siding it out in aggressive matchups though. 4) Kozilek’s Return: With 5 Eldrazi’s and loads of ways to discard this card it’s easy to completely wipe your opponents board while you stay behind with a creature. This deck can also struggle against the really aggressive decks so Kozilek’s Return definitely deserves a spot as 1 of the 4 rares. Writing about this deck has gained me some more interest to trying out. So on the next Gentry event I might show up all Stitched! For the last deck I’ve kinda cheated a little bit. This build is not straight UR but more mono red with a slight Blue and Black splash. Originally I had UR control in this spot, but Kenneth Pletinckx already provided us with a well-written analysis of that deck. Be sure to check his article out. Let me start by saying this deck is only theoretical at the moment, testing it should allow me to find out if it’s a viable option or not in this current metagame. The goal of this deck is very simple and elegant, you burn your opponent’s face with as much spells you could possibly sling at them. – 14 spells that deal 3 damage, 8 of them which can be madnessed out for 1 mana. – 12 Spells that deal with creatures, 8 of them that also shoot the opponent. For reference, the Naya burn deck in Modern plays on average 19 spells that deal 3 damage and 4 that deal 4 damage, backed up by some ongoing threats in Eidolon of the Great Revel and Goblin Guide. Luckily, Gentry isn’t such a fast format as Modern, so you could get away with playing some fewer burn spells due to card availability. Hungry Flames is the newest addition from Aether Revolt that really makes this deck tick, I believe. Of course it’s no Searing Blaze, but removing a creature and also shocking your opponent is really all what this deck wants to do. Imagine having to throw some Fiery Tempers at your opponent’s creature to stay alive, once you’ve reached that point you might as well scoop up the game entirely. Hungry Flames, and to a lesser extent Lightning Axe, give you some interaction while also affecting your opponent’s life total. That is, if you manage to Madness Fiery Temper or Alms of the Vein with the Axe. Speaking of Alms of the Vein, it’s really the biggest draw to black, as it’s one of the few cards that can deal 3 damage for 1 mana. Gaining 3 life is no slouch either, as racing is all this deck wants to do. I’m not sure if Thermo-Alchemist should be in the main deck. I could see a case where it has a spot in the sideboard and comes in after your opponent sided out all of their removal. On the other hand, it really makes sideboard a lot more complicated for your opponent if they also have to leave some creature removal in their deck. You could call their bet by siding out the Alchemists for game 2 and then side them back in for game 3 if you are on the play. 1) Bedlam Reveler: This deck plays 30 instants and sorceries. It won’t be difficult to have this card cost RR and draw you 3 cards. 2) Collective Defiance: Have I mentioned how important Hungry Flames is? Well this card is the same but better. Dealing 4 to a creature and 3 to the face is nothing to laugh at! 3) Fevered Visions: This card serves a similar role to Bedlam Reveler, allowing you to keep drawing gas until you have found enough spells to burn your opponent out. Oh and it also burns them for 2 each turn! 4) Dynavolt Tower: This card has the highest synergy in this deck. Suddenly all your spells deal a virtual 1 damage extra. This was one of the first rares that went into this build. That’s all for today people. I sincerely hope you enjoyed reading this article, I definitely enjoyed writing it! Be sure to let me know what you liked most and if there is anything I could have done different. See you at one of the Gentry events!